Wes and I went strawberry picking last Friday with our friends Erin and Eilley. I was so excited to go because Daniel Tiger goes strawberry picking in an episode and Wes really likes strawberries. Wes was pretty excited to go until he fully understood the conditions. Unfortunately it rained most of the week leading up to this outing and it was very, very muddy. This is Wes giving me a status report on the mud before we even got to the worst part. Honestly I didn’t think Wes minded mud. So I learned an important lesson about my son’s preferences. He HATES mud. Or, he hates mud when he’s wearing the only water/all-purpose summer shoe I have for him, Natives, which have small holes in them. I tried to talk about what happened on our car ride home and I feel clear it was the shoes but unclear of the specific details surrounding the problem of the mud and shoes combination. I think the holes might be it. I think he needs rain boots for a future activity like this. Wes did pick some berries. When he was standing in a less muddy spot, I think he enjoyed finding the red berries and putting them in his basket. If it weren’t so muddy, I can imagine him getting really into it. But this time there was a lot of crying about mud. Initially I tried to talk him through the mud and explain where he should step so he could enjoy this outing more. I gave up when nothing seemed to work and told him (in a kind way) to stand in the grass if he didn’t want to be in the mud. Because I didn’t drive an hour to go home after 10 minutes with two strawberries. So he stood in the grass. He also explored the grassy area and watched the big kids and ate maybe a few too many strawberries before we paid for them. He was pretty patient while I kept picking. I had a lot of fun and was so happy with my full bucket! Thanks for your patience, Wes. 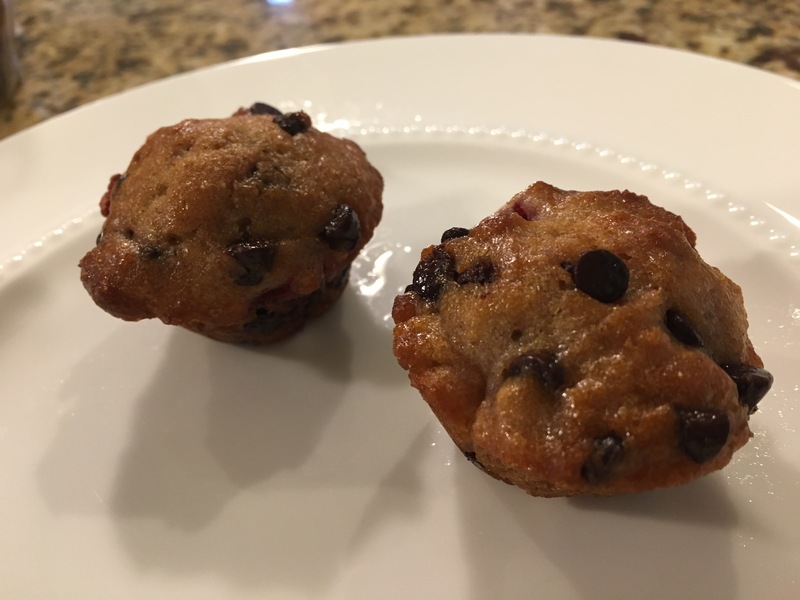 Erin sent me the recipe she planned to make with her strawberries, Strawberry Chocolate Chip Muffins. They looked so good that we made a batch too! I made ours mini muffins so I could freeze them and use them for Wes’s breakfasts. They are delicious! I substituted one cup of all-purpose flour of a cup of whole wheat flour but kept everything the same. Erin told me she was planning to swap in applesauce for the oil. We both opted for mini chocolate chips instead of regular chocolate chips. You could maybe half the amount of chocolate chips if you were looking for a little more strawberry flavor. Personally, I will probably always make these will a full cup because that’s what’s important to me. Just some ideas for you if you decide to give these a try yourself. Not surprisingly, they are the new breakfast favorite. They are a very tasty muffin, so I do recommend them if you’re looking to do something with your strawberries. And next year I’ll watch the weather more closely and plan our strawberry picking outing for a dry week. This entry was posted in cooking, Wes by Sarah. Bookmark the permalink.